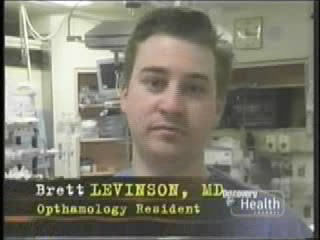 I just found out that my friend Opthamalogist Dr. Brett Levinson (C'97, AEPi) was another doctor featured on a TV show. A few years ago (better late than never! ), Brett was featured on a Discovery Health Channel show called The Critical Hour. Filmed "on location" at the Shock Trauma Hospital at the University of Maryland in Baltimore. At the time, Brett was a senior resident on-call for trauma for Ophthalmology during the filming. According to Brett, he is now in private practice, and doesn't see much trauma anymore.